Vocabulary instruction must be explicit. Explicit vocabulary instruction includes an easy-to-understand definition presented directly to students along with multiple examples and nonexamples of the target word, brief discussion opportunities, and checks for understanding. Vocabulary instruction must include multiple practice opportunities for using words within and across subjects. That is, instruction must be extended over time with opportunities for students to hear, speak, read, and write words in various contexts. This builds students’ breadth and depth of vocabulary knowledge. Vocabulary should be taught schoolwide and across all subject areas. Each subject has a unique set of vocabulary terms, and students need to know their meanings and how to use them in various contexts. not part of students’ prior knowledge. ELs may require even more careful word selection and extensive vocabulary instruction because they may be learning conversational language and academic language at the same time. Colorín Colorado provides additional information about selecting vocabulary words to teach ELs. 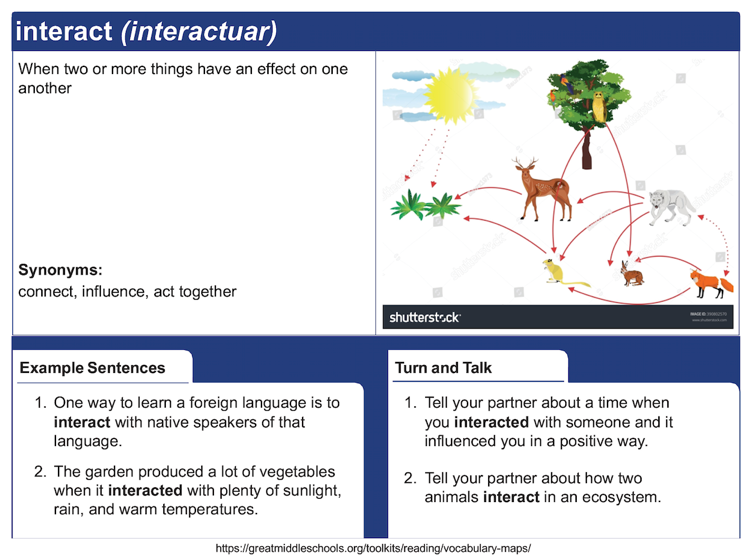 The five activities described below are effective ways to teach vocabulary for all students, but especially for struggling students, students with learning disabilities, and ELs. Teachers use a simple graphic organizer to preteach the meanings of important words in about 5 minutes per word. During this routine, teachers introduce target words with definitions, visual cues, and examples. Students engage in immediate practice using the words through collaborative student turn-and-talk activities. One way to have students extend their knowledge of important words is through a Frayer model. This graphic organizer builds vocabulary and conceptual knowledge across content areas. The strategy requires students (not the teacher) to define a vocabulary word and then list its characteristics, examples, and nonexamples. 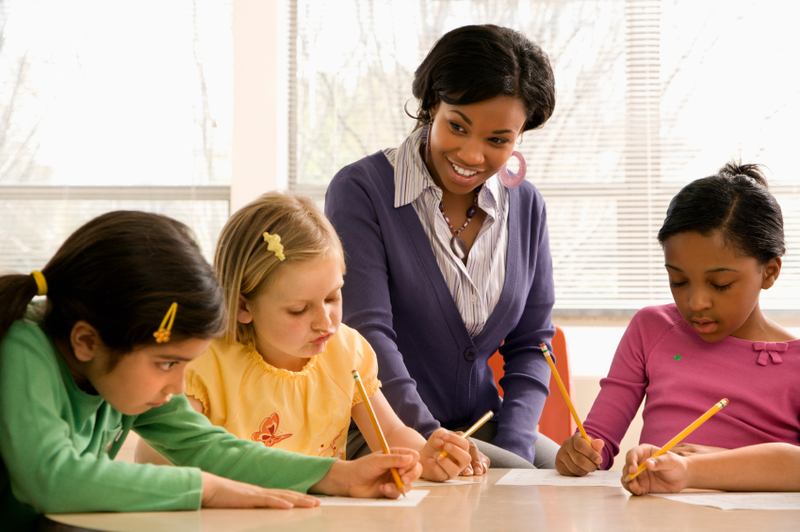 Frayer models can be completed in collaborative groups using textbooks and other subject-matter materials while the teacher circulates around the classroom and assists students. Semantic maps visually display and connect a word or phrase and a set of related words or concepts. Implementing semantic map activities in your classroom will help students, especially struggling students and students with learning disabilities, recall the meanings of words and understand how multiple words or concepts “fit together.” Teachers will find that using a semantic map, combined with explicit instruction and practice opportunities, is an effective way of expanding students’ vocabulary and supporting their content knowledge. Multiple opportunities to practice using new words is an important part of vocabulary instruction. In previous TCLD research studies, brief review activities were built into novel unit lesson plans to help students practice (and remember) the meanings of important words. Each of these activities takes 5 to 10 minutes and is easy to prepare. Partner Review Routine: Partners work together to quickly review words learned the previous day. Sentence Review Routine: Partners create sentences using words assigned by the teacher. Examples and Nonexamples: The teacher tells students scenarios or shows pictures and students respond chorally to each scenario, indicating whether it is an example or nonexample. What Word Fits? The teacher asks a question and student partners hold up an index card with the word that fits or answers the question. Explicit instruction of words is important, but it is impossible to teach all the unfamiliar words students will encounter. One way to help students develop strategies for approaching unfamiliar vocabulary is to teach morphemes (prefixes, roots, and suffixes). Students can be taught the following morphemic analysis routine to help them engage in independent word study. 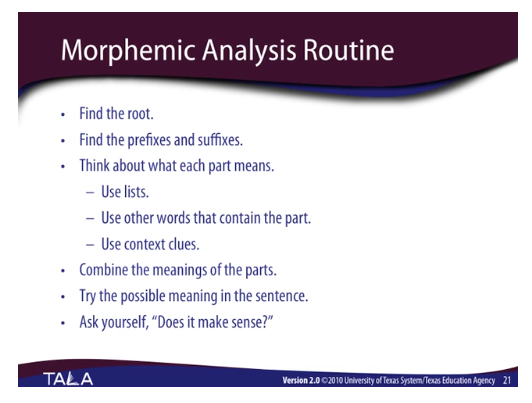 Learn more about the morphemic analysis routine by reviewing this online learning module from the Texas Adolescent Literacy Academies.